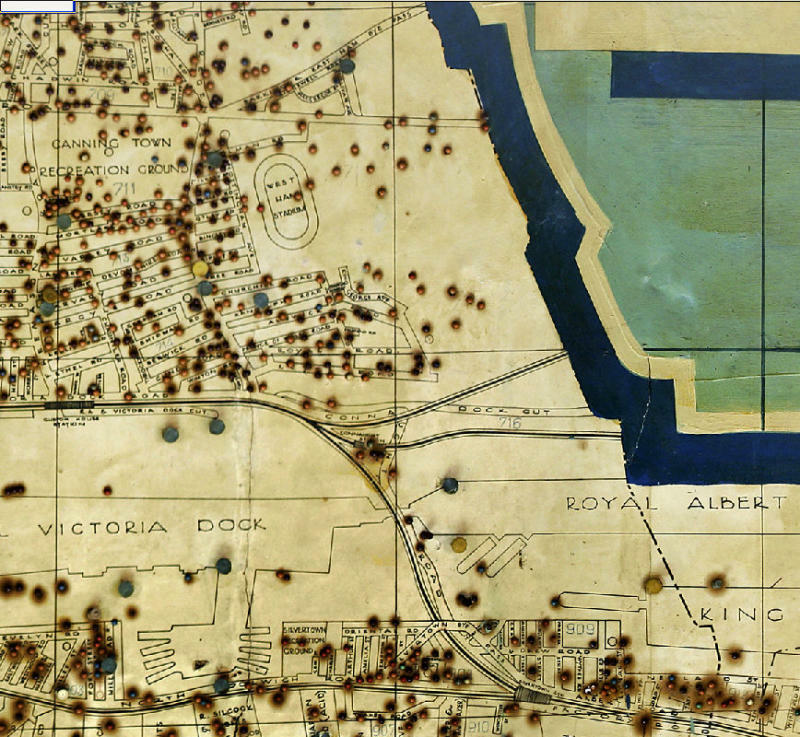 The following series of maps show the record locations of various war paraphernalia that fell on the County Borough of West Ham during World War II between 1939-1945. Item recorded include High Explosive bombs, Parachute Mines, Incendiary Bombs, Oil Bombs, Anti-Aircraft Shells, Crashed Aircraft, U.P Ammunition, Phosphorous Bombs, Parachute Bombs, Flying Bombs and Long Range Rockets. 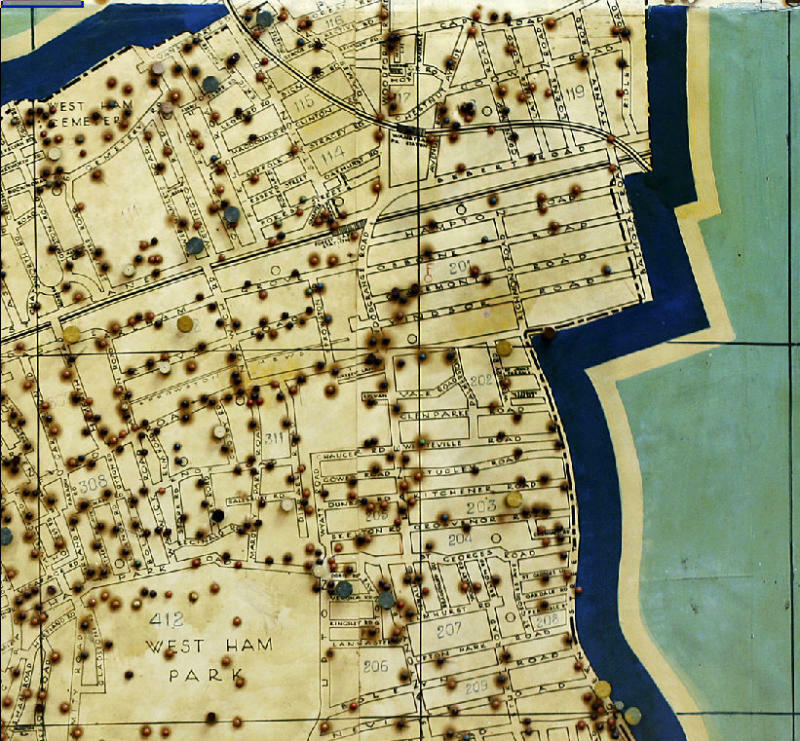 The are other websites showing bombs that fell on Greater London only during the Blitz during 1940-1941. I came across his picture of Stratford Broadway dated 1929 which I had not seen before. It is quite clear in it's detail. The one thing that struck me is is shows traffic flowing both ways either side of St John's Church. Presumably at this time the traffic must have merged by West Ham Town Hall. Traffic still appears to be relatively light but I would have thought it could not have been long after this date for safety reasons that the permanent gyratory system was introduced. West Ham Lane was originally a connecting road between the settlements of Stratford and West Ham. 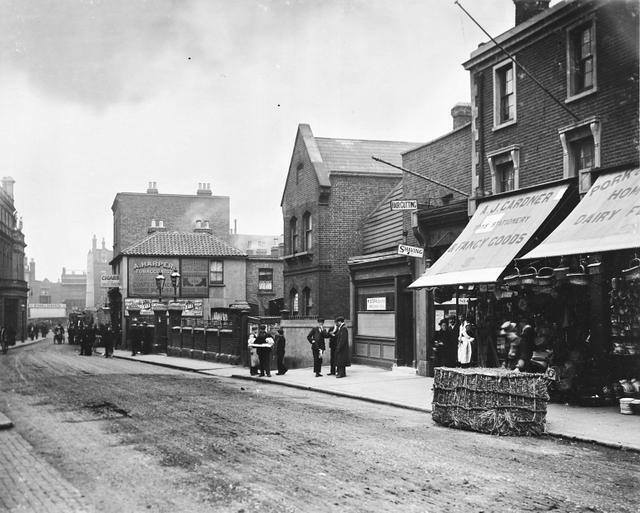 As the area expanded, the thoroughfare became a mini-shopping area in its own right and also sported the local police station, court house and Queen Mary's Hospital. Some of the most frequented buildings of the past must have been the Public House. Although to be found in virtually every village, east London and Newham had more than their fair share. Public Houses or in many cases Inns are some of the oldest buildings to be found on maps. Many transformed with newer buildings over the years but remained on the same site. Now due to rapidly changing social trends, often centuries of history are rapidly coming to an end, as like sand castles on the beach, public houses fall one after one to the incoming tide of modernity. 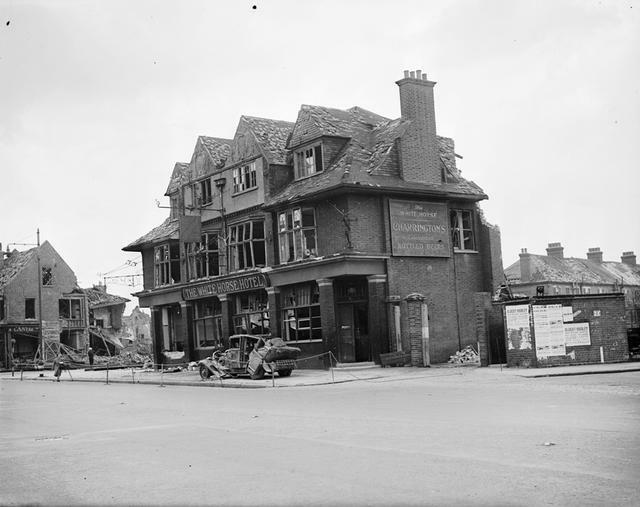 Newham had something of a reputation for public houses with seemingly one appearing to be on every street corner, and also halfway along each street. I remember as a youth trying with friends to 'do the round' of Stratford Broadway which has something like fourteen public houses all in close proximity to each other. Although some public houses had notorious reputations, for most people they were places where they could socialise with others on what was something of a neutral ground. Public house also served as a form of escapism from what was poor housing conditions at the time. 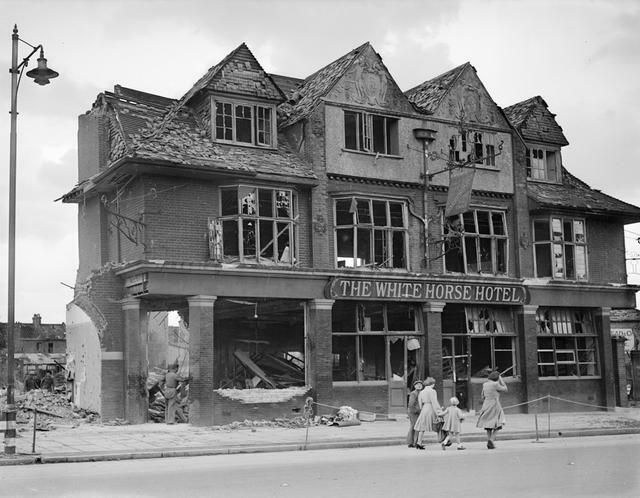 I have started by adding a few photographs to the White Horse Inn that proudly used to stand in High Street South opposite Central Park, and which has now sadly fallen to redevelopment. Newham memories and nostalgia / Maryland Point. I think most of us know Maryland Point which conjures images of a tiled station entrance facing onto Leytonstone Road. However I recently across a 1936 picture which shows the original station was actually in Water Lane on the Forest Lane junction. Newham memories and nostalgia / Do I know this place? I no longer live in London but it's sometimes nice to use the magic Google Earth to transport oneself back to those areas one used to know. 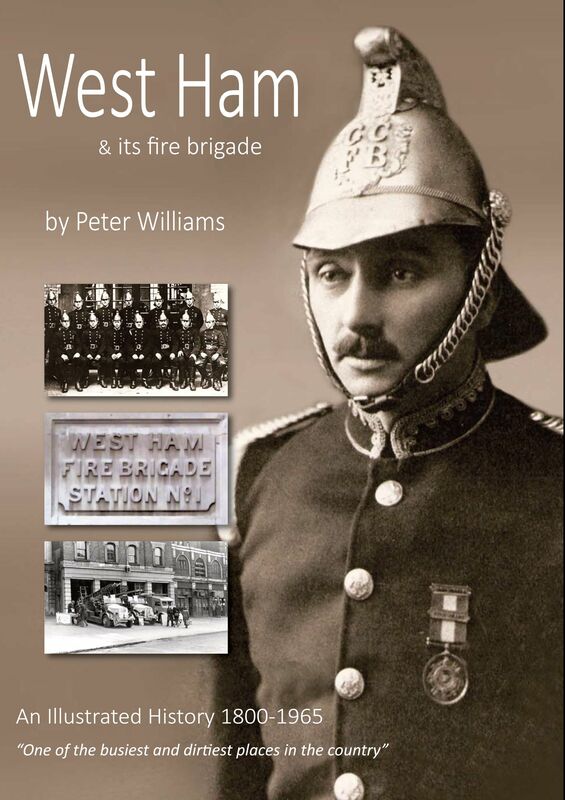 Being based at Plaistow Fire Station the area covered by my station was virtually everything south of the Metropolitan line between Green Street and the River Lea. It is an area I knew like the back of my hand. 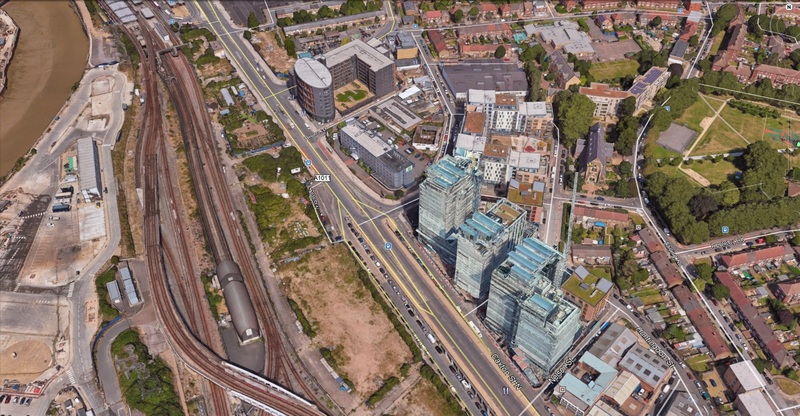 While looking around on Google Earth, I came to the Caxton Street North/Silvertown Way area only to find it virtually unrecognisable to anything I knew. New road systems and layouts, what looks like private high rise residential apartments and so on. This was previously an area full of light industrial businesses. I know change s to be expected, but never-the-less, when one sees it on such a scale, it still comes as bit of a shock. Newham memories and nostalgia / Do you see what I see? I have mentioned several times in various debates, that the area of land known as Newham and its predeceasing boroughs of East and West Ham, are still relatively young in historical terms. While that thought was rolling around in my mind, I thought it would be a good opportunity to expand on that theme a little from the perspective of those who lived in Newham at an earlier time. 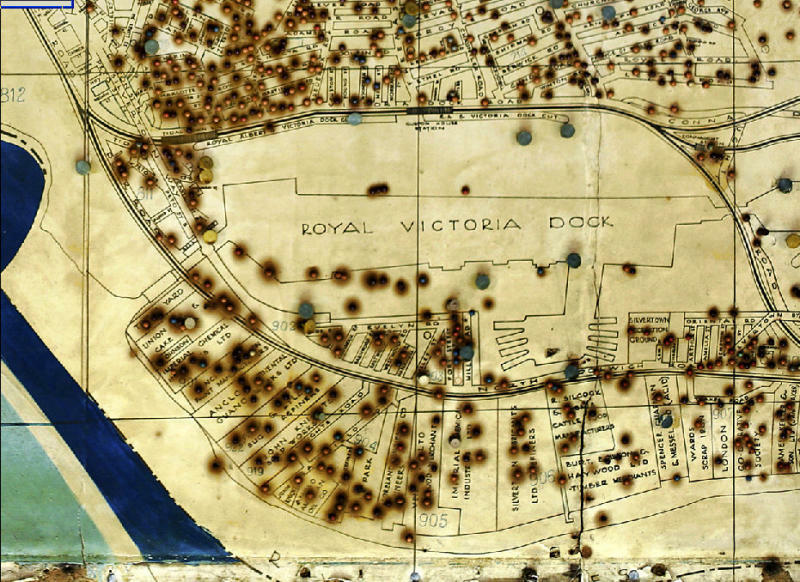 I have been studying a 1893-1895 Ordnance Survey map of London which includes most of Newham. The link to the map to paste into your browsers is at the bottom of this article. 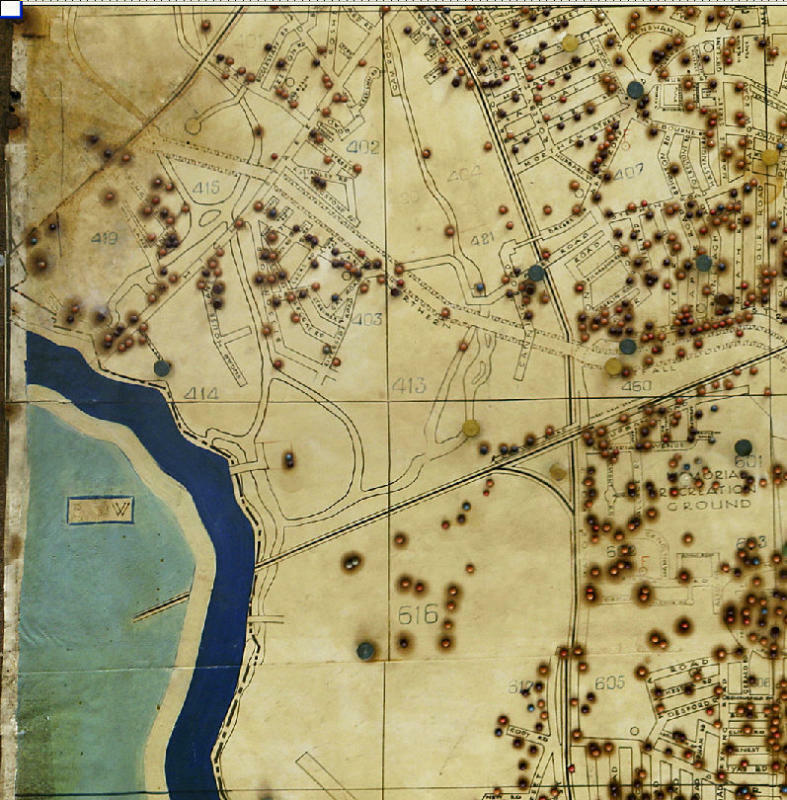 The map can be zoomed in and out to show fine detail. Some of the what we now consider to be the key road infrastructure had not yet been built and some of peoples movements, employment, habits and perceptions would have been influenced by what existed at the time. As an example, if someone were to look at a open green field and come back some years later with another person and see the field had been built on, the first person would be able to visualise in their minds eye, what had existed previously to what existed now. The newcomer however would have great difficulty in visualising the field that had previously existed. 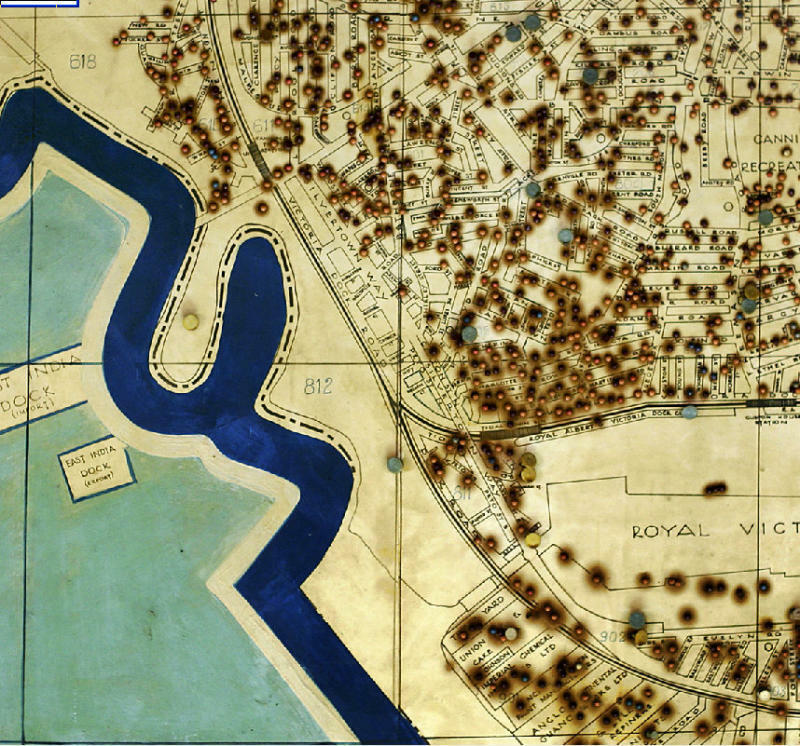 So it must be with all our memories as each succeeding generation witnesses change to their environment, and only the written memories of those that have passed before, (local historians), aided with items like maps, can help convey a possibly different way of life. In the south of the borough, virtually everything east of the Beckton Road/Forty Acre Lane junction is shown to be undeveloped open land. Interestingly Forty Acre Lane is shown to be north of the Beckton road rather than south of it which it s now. Much open space can also be seen east of Green Street and Katherine Road. 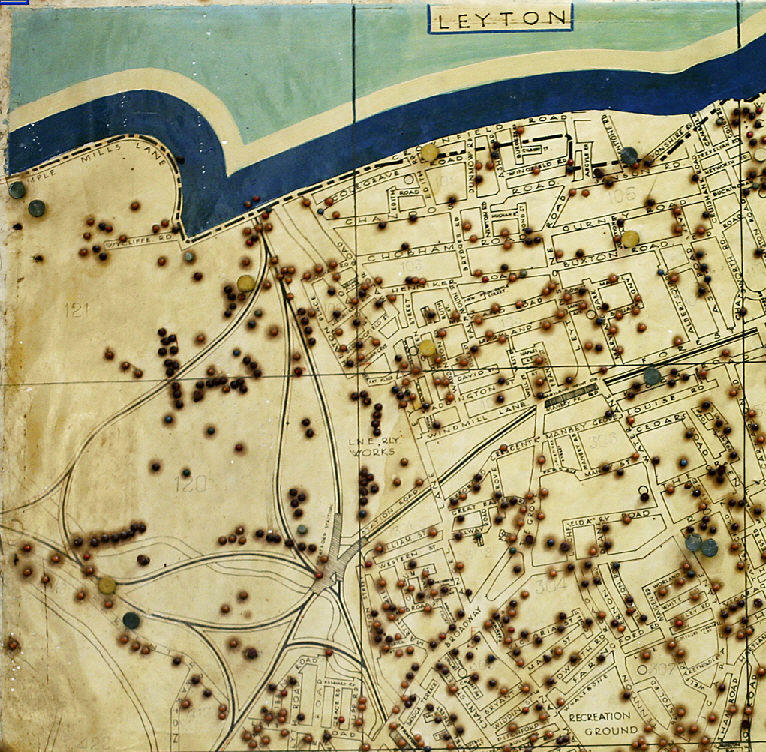 To the north outside the borough, Ruckholt Road and the Eastway in Leyton that cross Hackney Marshes also have yet to be built. This would have heavily influenced locals of that time, with the main route for travellers going in that direction being along the old Temple Mills lane via Angel Lane route. I always remember Temple Mills Lane as little more than a narrow back road, but in its time, locals would have perceived this as a major route. Carpenters Road only went north westwards as far as the River Lea and much of the heavy industry had yet to be developed. To many locals at the time, Carpenters road may have been perceived as a pleasant walk into the countryside. 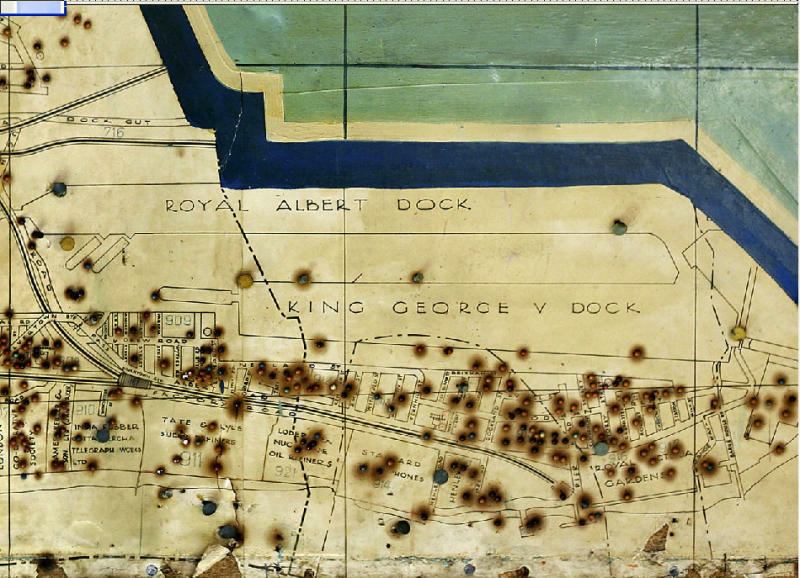 The Royal Victoria Dock shows numerous jetties protruding out into the dock, something that did not exist in the time I knew them and I must admit, I never knew they existed until I saw them on the map. 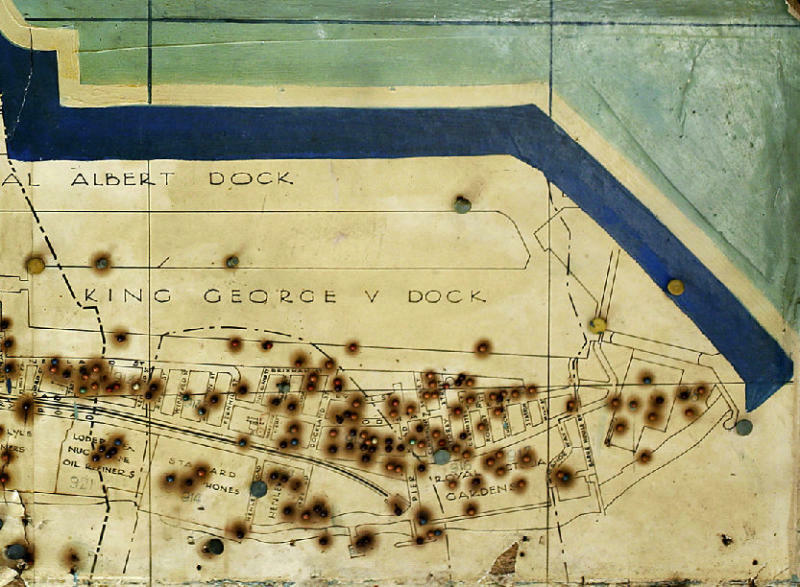 Once again, a person working in the dock in the late 1800's would have had a completely different perception of its layout than later generations. The more one studies the map, the more one sees. I have little doubt that todays younger generation will in the future, have a lot to tell as yet unborn generations how things used to be in Newham. I suspect that change in this part of the world will be great indeed as what are now 100 year old, become 200 year old terraced houses. Somehow I suspect most will not last that long. It will not be long before a youngster of today starts a conversation with, "I remember when.............". 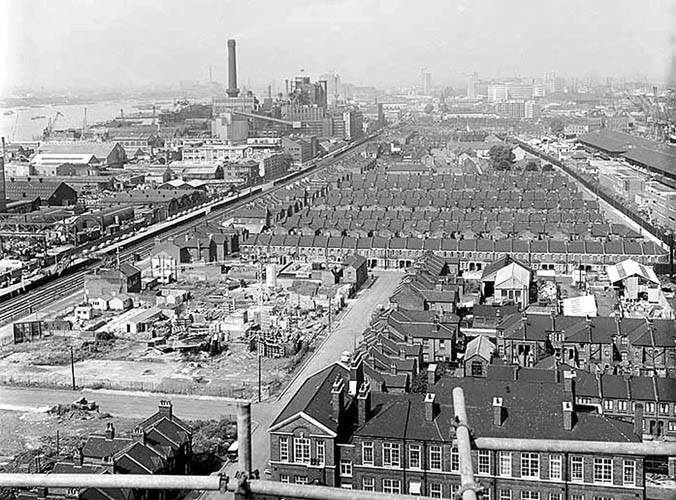 Until recent years, little appears to have changed in North Woolwich and Silvertown in the intervening 60 years between these picture. Apart for lorries replacing horses and tarmac replacing dirt and cobbles, the same houses and railway lines are still there. Except for those demolished in the Silvertown Explosion. Now shipping has gone as has much of the heavy industry to be replaced by a airport, sporting and entertainment facilities. The 'island' as it was once known has now become an integral part of Newham again and the docks once taboo to enter except for those that worked there can now be strolled around. It is difficult to imagine from these pictures that a cable car would eventually link the area to south of the river. Traffic hold-ups caused by the 'bridgers' as they were once known, are now becoming a distant memory thanks to upgraded link roads. Earlier this week was my 72nd birthday and many thanks to all those that sent me birthday wishes. The following morning when I awoke for some reason the thought immediately crossed my mind of how different, if not alien, the world I was born into must seem to someone born today. I was born just after the end of the war in 1946. A little simple arithmetic shows deducting my 72 years from the year of my birth is equivalent to that of a person being born in 1874 when I first entered the world. To me like I suppose it must also seem to many of us old un’s, that I remember my childhood well, my school days, my early working life, followed by my fire service career until I eventually retired. Again I suppose like many, it still seems like yesterday, but the world I was born in must appear as alien to a youngster today, as to that of the world of someone born in 1874 must have seemed to me. I don’t want to hark on about the tin bath hanging on an outside wall, the outside toilet, gas lamps or coal fired cooking range which many of us like I grew up with. but for many people born in 1874, even these basics must have seemed a modern luxury, compared with the like of the no sanitation at all world they were born into. Many of us grew up in a victorious but war torn nation. The war heavily influenced our childhood with hundreds of thousands of servicemen who had experienced its horrors, coupled with a recently Blitz blasted civilian community fresh in everyone minds. Now 72 years on, the vast majority of those people, communities and their memories have now passed on. It does make one think that to many youngsters today, WW2 must now seem as becoming as remote to them as the battlefields of 1874 would have seemed to me. As an example, the Zulu wars did not occur until 1879. My grandmother was born in Camberwell, south London in 1881 an maps of the time show almost everything south of the Peckham Road was open land containing many market gardens. All that had disappeared under rapid urban expansion by the time I was born, but likewise much open land I knew as a youngster has equally disappeared. It is as difficult for a youngster today to visualise the open fields I once knew as it is for me to visualise the open fields of my grandmothers time. 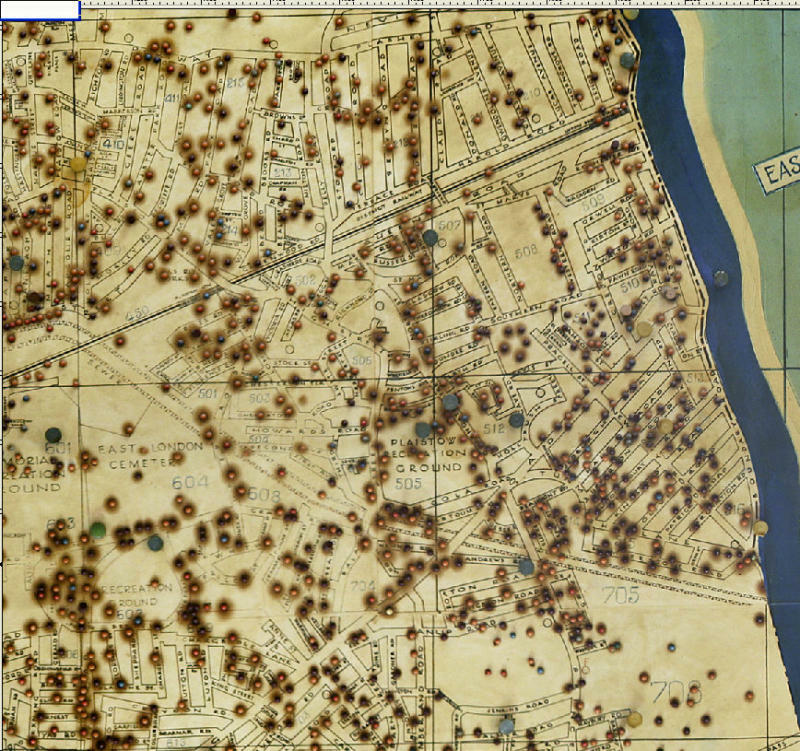 Likewise maps of that time of what is now Newham would equally show lots of open land. What had been hamlets like Plaistow, Little Ilford, Wall End, Forest Gate and so on, were starting their outwards growth until they were to merge in the not too distant future into East & West Ham before eventually becoming Newham. At that time, Canning Town, a relatively modern settlement, would have been little more than a collection of buildings surrounding Bidder Street. One only has to look at a zoomed out aerial view on Google of London and the southeast to see the blur created by buildings now runs almost unchecked from Heathrow in the west, to Shoeburyness in the east, bar for a small break in Essex. Compare that against a immediate post-war map showing buildings to see just how much land a rapidly ever growing population is gobbling up. I do not know what the remote future will hold, but it is things like the above examples of the rapidly disappearing countryside that tell me it will not be in the too distant future, that governments will seriously be debating birth control measures. Newham memories and nostalgia / Christmas comes but once a year - but when does it start? We are now but a week away from December and for many the 1st December was the start of the traditional run up to the festivities. Planning for a Christmas tree, not too early lest the pine needles started to drop before the magic day itself. Dad would plan a trip into the attic to rummage around for the boxes containing all the decorations, followed by a examination of said contents to see if they would survive the ravages of another year, or whether some would need replacing. There was no early supply of frozen turkeys, or a large hen if you were not so fortunate, as no one had freezers to store them. These were either ordered in advance at a butchers, or bought 'fresh' in the market much later if you cared to chance your luck. In many ways the run-up to Christmas used to be something like a pre-planned military operation. Everything had to be catered for in advance but the logistics of the time, as well as a sense of decorum dictated that nothing could be done too early. As children relishing thoughts of mince pies that would soon be appearing in the shops, as well of hopeful expectations of presents to come filled our minds. Our mums had been 'stocking-up' since the Autumn and many still made their own tradition Christmas puddings. As children we all got to stir the pudding and were allowed to run our fingers around the empty bowl to taste the scrapings. 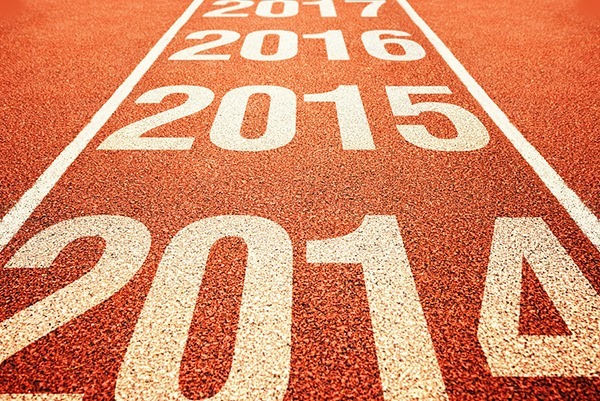 Early December tended to be something of an expectant lull with nothing much happening other than a child's ever-growing expectation. Trips to department stores to see Santa and sit on his lap while he gave you a cheap toy normally occurred during this period. Schools also began to make their preparations with the traditional licking of coloured gummed strips of paper to make paper chains to hang around the wall. In the playground kids would begin to boast about the presents they expected to receive with each kids claim being bigger and better than the previous child. In the austerity that was post-war Britain, very few of these exaggerated claims would be realised. And then about a week before Christmas it was almost as if Eisenhower had given a silent 'Go' command for D-Day. Families across the country all suddenly sprung into action. Dad would normally come home from the market struggling with the weight of a real conifer tree. Paper decorations would be hung up in the lounge usually emanating from a central point towards the wall like drapes of garlands festooning the room. Further chains of decorations would be hung around the walls of room. A small table would also be set up to hold all the bottles of festive cheer. Come Christmas Eve children would find it hard to sleep or contain their excitement for the following day. I forget how many times I would wake up in what seemed like a eternally long night to go into my mothers room and shake her to ask if it was time to get up yet? Dawn of Christmas would finally break although mums would have been up long before to put the turkey in the oven. Children still in pyjamas would be eagerly tearing decorative wrapping paper off their presents to see what goodies lay within. Sometimes it was just what one wanted or perhaps a pair of socks from a aunt, how thoughtful of them. Many dads would don their best bib and tucker and disappear, or perhaps that should be escape to the pub until lunchtime. Eventually came the great feast itself with the table decked out with every delicious treat one could think of, except perhaps for the Brussel sprouts which adults seemed to love but most children did not. As children we never got a sniff of a turkey leg as that was reserved for adults only. As I grew older that had reversed and children got the legs instead. A flaming Christmas pudding appeared with lashings of custard and cream. It was afterwards everyone suffered from that bloated feeling as everyone lazed around imbibing drinks or lemonade awaiting the traditional Queen's speech. Christmas itself was only a short period of festivity consisting of Christmas Day and Boxing Day. Following that people went back to work with the next public holiday not being until Easter. Even New Years Day was not a holiday then. Slowly at first as the years passed, commercial interests started to introduce Christmas fare into their stores earlier each year. Mince pies and crumpets became available all year around and the Christmas period gradually got extended for many workers well into January. It does seem now like the trappings of Christmas start well before the first leaves had fallen. While this may be good business, I sometimes wonder if somehow Christmas has lost a lot of its flavour from the time it was concentrated into a short period of time? From the day we are born we start to develop individual interests. Some interests develop later in life as we grow more knowledgeable, others may be the expansion of a natural talent, but collectively them make up who we are as individuals. 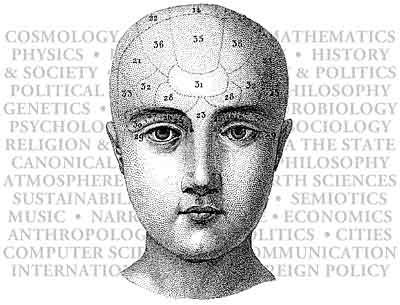 Some interests may be physical as in sport, others may be more sedentary like reading, acquiring knowledge or stamp collecting. What ever our individual interests or hobbies are, it is possible to become so involved in them, that we acquire a degree of expertise in our own right. Some interests may develop from our field of work, or perhaps we are drawn to certain occupations simply because they are compatible with our interests rather than the amount we can earn. Very often it is the environment we work or live in that either kindles or fosters individual interests. My own interests are varied starting with a thirst for knowledge since ever I can remember, through to youth work when I was younger although this has faded with age. History both national and local which probably developed more to the fore as I grew older Genealogy which in a way is a off-shoot of history. Computing and programming which started when I was about mid-twenties and well before things like the internet had been invented. It is also an interest that has thrust me to the fore employment wise in the fire service well after my actual fire-fighting days were over. A good understanding of science and physics is something else I also developed to a point that it does make one question and become sceptical of many of the scientific theories that are the current flavour like dark matter. The enjoyment of classical music is something I have also developed over the years. When we take all of our individual skills and interests and merge them together we form communities. Sometimes like-minded communities with a single thought of purpose but more often, a with a much more diverse range of knowledge that we know who in our community to seek advice from when they posses more detailed knowledge on a subject than we may have ourselves. In many ways, public libraries used to cater for that need through technical manuals although the ease of access to information via the internet has become more dominant. As most of us will have lived or worked, maybe both in Newham, it would be interesting to hear about others interests and how the environment of Newham has either honed or suppressed them. The name of Newham as a place is something of a broad-brush which tends to hide the many different areas within the borough. Newham is a not particularly large spot on the map of the UK, but it has so many varied areas that are completely different to each other, either now or in the past. If one wanders around say the new shopping complex at Stratford, it would be hard to visualise that not too far away used to be one of the busiest shipping areas in the country. Walk across Wanstead Flats and again it is difficult to visualise the other end of the borough is heavy industry. I suppose to a degree we are all a bit territorial, knowing those parts of the borough where we lived or worked with perhaps other areas of the borough being completely alien to us if we have never had occasion to visit them. Newham was originally a collection of small and scattered hamlets which grew and merged into each other, but in a way, those hamlets still remain and are quite identifiable. Among the original hamlets are places like West Ham and Plaistow with newer ones like Custom House appearing as Newham grew. To the individual, even these smaller areas of the borough would have seemed large as children where our home beat tended to be the few streets around where we lived and our horizons gradually expanding as we grew older. In these even smaller areas distinctive communities developed where frequently a common theme ran through the community, be it things like the local church, dock work, railways or perhaps other industrial related work like sugar. Over time communities became displaced through either modern housing development or industrial change but new communities have always emerged to take their place. I am thinking that this might possibly be a good thread for contributors to share with us their local knowledge of their 'bit' of Newham as opposed to the more grandiose spread of Newham as a whole. Do you remember how as kids at this time of year we would go with our mates either into the forest or where we knew there were horse chestnut trees in search of our annual harvest of conkers. Arriving home our mothers would be pestered for meat skewers and bits of string to make holes in our round treasures. Conker battles would then commence either with other kids in the street or with school mates in the playground. Now this 'dangerous' sport has been stopped in most schools or heavily sanitised in a few which required protective clothing in the form of goggles and gloves to be worn. The playgrounds used to be full of mostly far-fetched schoolboy stories of how they had baked their conkers in vinegar. There was also a cult language all of its own for conkers like a one-er, two-er or 'cheesers' which were prized due to the wedge shaped edges they had. Sadly though in this high tech age, schoolboy pursuits such as this have largely gone out of fashion. I took my dog for a long walk this afternoon in the fields that surround my village. The warm autumnal sunshine was quite pleasant too. Two of the fields are divided by the River Yeo with a bridge which has hunters gates at either end linking the two. Part of the route brings me to a disused footbridge which once was the primary connection to the adjoining village of Limington. A footpath used to run between the footbridge and Yeovilton Weir. Years ago a new road using a slightly different route between the two villages was constructed and the footpath and footbridge fell into disuse. The line of the footpath can still be seen however where it ran through a field as it was lined with horse chestnut trees. I walked along the line of the old footpath today and below the mighty horse chestnut trees thousands of conkers lie strewn on the ground. The trees still carry thousands of conkers waiting to fall and while I was there, continual soft dull thuds could be heard as even more fell to the ground. The sight of so many thousands of conkers, all in pristine condition just lying around, untouched and uncollected I find sad. As a schoolboy such a treasure would have carried enormous street credit if you could find them, but now they are like a disused currency not wanted by anyone. In some ways it is like finding the Count of Monte Cristo's treasure and leaving it where it is as worthless junk. I did bring a few home as my wife believes that new conkers placed on the window sill act as a spider deterrent. I suppose in some ways it is a sign of how things change with time and could not but help be left wondering, that if there was such a thing as a Iphone tree, whether future generations would not be bothered to pick those 'old things' up. I suppose in many ways, it was the advent of the electric tram that opened up greater vistas for people in terms of where they worked or leisure. Up until then for most people, travel was either a choice of the either much slower horse drawn tram, or 'Shanks Pony' as most people could not afford a horse or even more luxurious carriage. 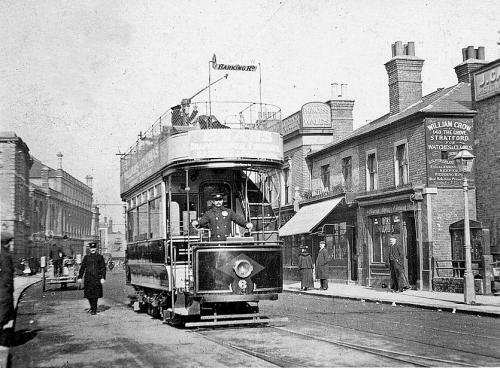 West Ham Corporation took over the horse drawn services of the North Metropolitan Tramways in 1903 and just a year later were able to introduce the first electric tram service. 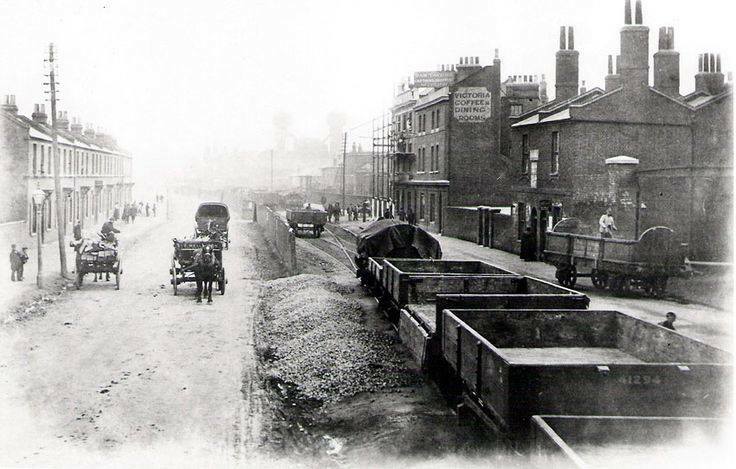 The first tram depot was in Greengate Street, Plaistow although other depots open later. 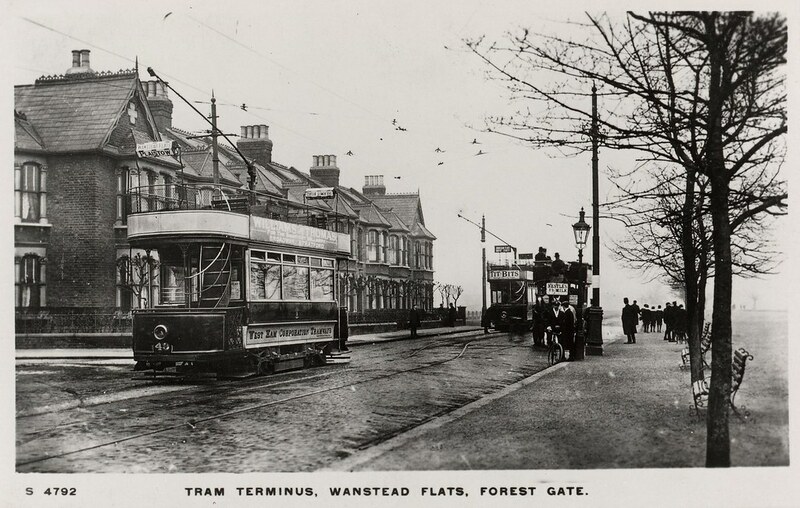 Initially trams terminated at the borough boundary which meant changing tram companies to continue a journey. Photograph by Basher Eyre of date stone on former tramway offices.